Question for you if I may - where does the bellows piece that comes with this miniature fit onto the cannon? Or is it something that is just laid on the ground near to the piece. I've searched the net and can't find any photos of the bellows attached to the cannon. Indeed most photos don't have the bellows in sight at all. 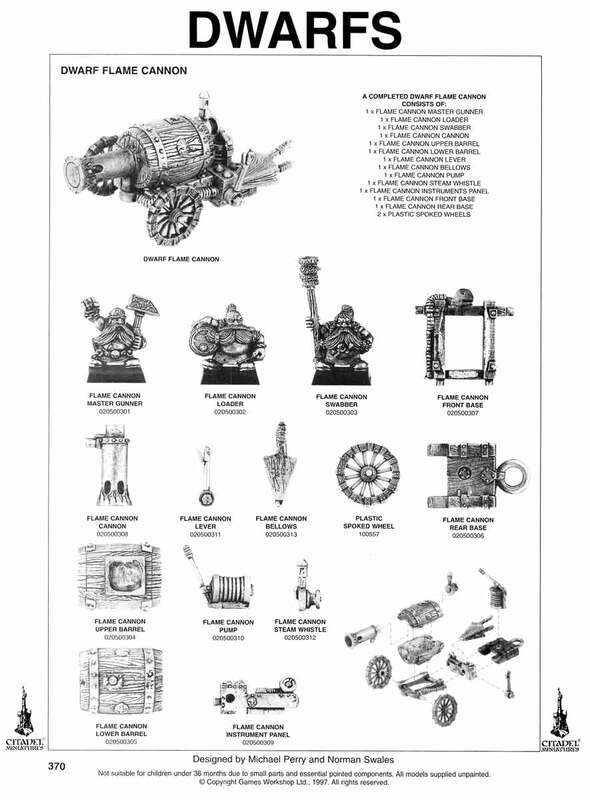 I've managed to get a couple via ebay, along with some other dwarf odds and ends and would like to fit them to my existing flame cannons if it's practical. Sort of hard to fit it all on a 20x40 though, especially with crew. Hmm, yes but that's on the 28mm one. On the 10mm model there's a screw-like(?) thing in a rectangular frame with a T-shaped handle at the end that goes in that position. Maybe it's an alternative type of bellows? On the 10mm one what is shown on your illustration as the flame cannon pump is present and goes in the middle just like on the 28mm one. I wonder if GW put both pieces in for buyers to choose from - although as I say, I can't find anything online that shows a 10mm with the bellows fitted. Yes, it would be tricky to fit it all on a 20x40 base! you are right, it is amazingly hard to find a picture online of the flame canon! Unfortunately, I can't actually help you as my canon came 2nd hand, therefore missing bits, even the horse and cart... so I made a best guess with the parts I had... I'll try and post a few closeups, if it helps you decide what to use... in the meantime I did find this single picture, with the bellows, on the ground... looks like this person didn't know what to do with them either. Good find! That particular cannon is rather short* on crew though, given that the bellows are so big and thus take up so much of the base. yes I noticed that too, he is a crew short. Cheers. Nicely painted models! Both of my flame cannons have the screw thing laid flat. I tend to agree, there's nowhere obvious to put the bellows and little room to place them on the base with a full crew around the piece. A bellow can always been use here or there. With an smith character, nearbay an anvil as an example. I think like you, guys, that this bellow is either a bit or a way to differenciate two canons. Maybe you have to chose if you set up the screw thing or the bellow ? And then you have two different figure.